Goodreads description--Caregiving is a demanding task that takes a huge toll on the person providing care mentally, emotionally, physically, and spiritually. Not much of a description there, is it? I originally requested this book because at the time a friend of mine had recently taken on the role of taking care of her father who was diagnosed with dementia and quickly progressed into the stages of Alzheimer's. When I saw the title, I thought it might be a nice book to recommend to her for this difficult time period. And so I requested the book from NetGalley. Because this wasn't something that I was personally struggling with, I put off reading the book. It's a short read and I have to say that I was pleasantly surprised. Having never dealt with being a true caregiver in my life (I don't even have children yet), the struggles that one might go through facing these types of situations were completely lost on me. And I have to say that having read The Struggles of Caregiving, I have a new found appreciation for the daily struggles that anyone having to be a full-time caregiver must face. I liked that the book was fast and to the point. Nell E. Noonan addresses some of the darker issues that caregivers face, and I have to applaud her for being so honest and real. I think that for anyone facing a care-giving situation, if nothing else, it would be a tremendous comfort to know that they are not alone. I haven't done a search on the subject, but I can't imagine that there are too many books out there that address this subject (I could be completely wrong about that, I've just never noticed any others). It's kind of like parents of abusive children--there's like hardly any "help" out there in the form of books. While Nell E Noonan makes her religious affiliation (Methodist) clear throughout the book, I think there are principles that can be gathered from the book whether you're associated with the Methodist doctrine or not. That being said, my standard disclaimer is always to go to the Source (the Bible, the Word of God) for any questions and for Truth on any issue. At this point in my life (because I've established that circumstances and experiences do play into my ratings), I can only give The Struggles of Caregiving 3 Stars. Were I going through a full-time care-giving situation that rating may be completely different--higher or lower. 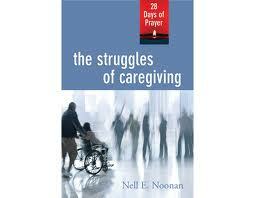 Have you read The Struggles of Caregiving? What did you think? Let me know!